Even though I've been a busy girl lately, I'm never too busy for a doughnut break! I especially love the mini variety. These are extra light and have a double dose of vanilla goodness. The idea for these came from the Starbucks Birthday Cake Doughnut, a very dense doughnut that is eye-catching with pink icing and tiny white nonpareils. Since my recipe turned out very light and fluffy (the exact opposite of Starbucks) I made them in my favorite shade of blue. The texture was not at all what I expected from a baked doughnut. I love them so much, I had to share! Newborn baby doughnuts... aren't they cute? 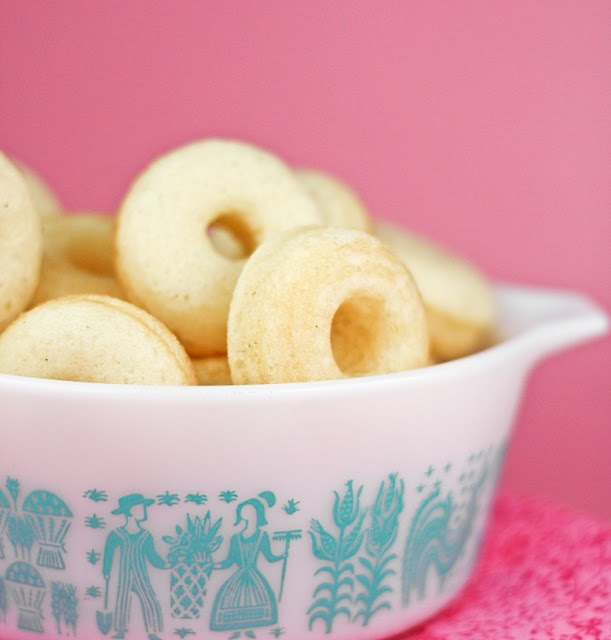 You'll need a mini doughnut pan for this recipe. I usually don't like to clutter my pantry with unnecessary baking equipment, but I'll make exceptions (like this tuile stencil) if something special speaks to me. I'm eager to experiment with other doughnut recipes, so I think this pan will be well utilized. The recipe is pretty strait forward, and the only extra advice I can give is to put the donut batter into a piping bag. It is so much easier to fill the doughnut cavities without making a big ol' mess. In large mixing bowl, sift together all purpose flour, sugar, baking powder and salt. Add buttermilk, eggs, vanilla extract, vanilla seeds and butter and beat until just combined. Spray doughnut cavities with cooking spray or brush with butter. Fill each donut cup approximately 1/2 full. Bake 5-8 minutes or until the top of the donuts spring back when touched. Let cool in pan for 4–5 minutes before removing. Finish doughnuts with vanilla glaze. Doughnuts are best served fresh. In small bowl, stir together sugar, milk and vanilla extract until sugar is completely dissolved. Add food coloring and stir until color is uniform. Use immediately to glaze doughnuts. Sprinkle on nonpareils. Those are too adorable. I love the aqua color! 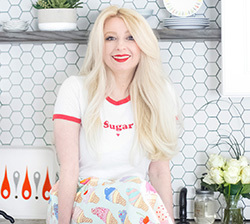 love the color of icing…love the bowl (is it vintage pyrex? )…please share where it comes from! Yes, the bowl is vintage. It's the Pyrex Amish Butterprint pattern in Aqua. I think it was made in a mustard color too. I have 6 pieces and the mixing bowls are my absolute favorite. These look so great! And I love how you display your food! I must admit, I have a serious crush - a doughnut crush! no yeast! you have made my day! and they are baked. these are on the top of my "to do" list! Love these and your beautiful pictures!! Love them!! I will definitely be making these soon. These have got to be the cutest thing!!!! Where did you find the pan? Those are darling! And your photos are amazing! I love that pan! I host Cupcake Tuesday every week, and thought you might be interested. 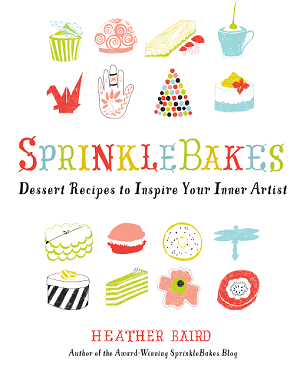 I also have a Cupcake Challenge going on this month, with great prizes and the author of What's New Cupcake is judging! these are just too cute... and your pictures are just awesome! Gosh these are adorable! I seriously went "aww" when I first laid eyes on them. Love the glaze colour! Turquoise has become my new best friend. Thanks everyone! April, I got them at Cook's Corner in Turkey Creek. For those who are not local and interested in buying, it is the Norpro Nonstick Mini Donut Pan and can be bought online at Amazon.com for $9.99. SO cute! And I love your little origami birds as well. So pretty, looks like Tiffany blue! The cuteness is overwhelming! I got a pan a long time ago but haven't had time to try making this yet. I shall wait no more :D Thank you for the inspiration. I *looove* these. They're gorgeous, and they're healthy (sort of anyway, heh). Oh, my those are darlin'! My babygirl loves birthday cake ice cream. I wonder how'd she dig birthday cake donuts? Wow, these look perfect and so sweet. I just happen to have a donut pan, so these are going into my bookmarks. Thanks for sharing this wonderful recipe. Your doughnuts are absolutely adorable, and I love the color scheme on the pictures. These are stunningly adorable. It's nice to know 'donuts' can be baked. Oh my gosh....these are so adorable!! SO adorable...and I recall my mother having that same bowl in a salmon type color print...nostalgia along with a good recipe: priceless :) Thanks! these are so stinkin' cute and mini!! I love the mini donut pan and yours are just too cute for words. The color is beautiful! Gorgeous! 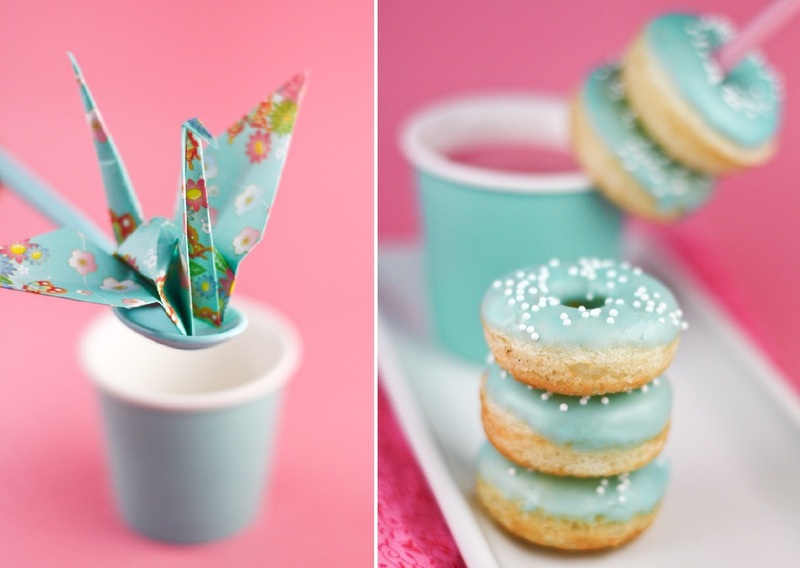 Love the origami, the vintage bowl, and the gorgeous blue of the donut icing. Loving the donuts...well, I don't need to tell you this girl loves her some donuts! Heather, you are truly gifted. 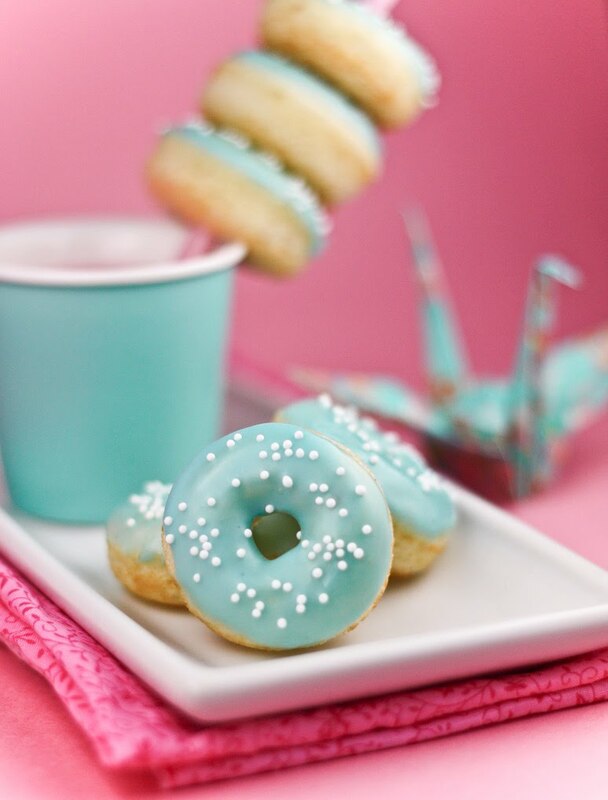 I LOVE the baby donuts and your blue color is superb! A soft robin's egg blue, one of my favorite colors. I do not particularly like to bake, but I now want to make these baby donuts! I want to buy the pan and everything. You are truly inspiring. Happy Baking! P.S. AND your photographs are amazing too! & that is a gorgeous blue =). These are totally fantastically adorable! I am just smitten with them! Oh god, they are the cutest doughnuts i've ever seen! These are so adorable. I didn't even know they made mini doughnut pans! The things I'm learning from food blogs. oh yes! i will be trying this recipe! every time i go into Starbucks i see these donuts in the case..but i have yet to try one. Great, now I guess I have to get one of those donuts pans, because I am pretty sure I cannot go on living without a mini donut! omg! those doughnut make me hungry. ouhh..im starving here!! These are so cute, I just had to hop over to amazon and order a pan right away. Can't wait to try out your lovely recipe, thanks so much! I absolutely adore them! OMG! You are really good. I'm going to buy me a doughnut plate as well. You don't know a good site transferring american recepies into liters? These doughnuts look absolutely perfect. Wow. I'm so impressed! I love these donuts, they are so cute. I however don't have a pan right now and can't wait to try them. Do you think they would work in a mini muffin pan. I will be buying the mini donut pan ASAP though. I have been obsessing about doughnuts lately but haven't found the time to make any...these are perfect! Seriously gorgeous, both the doughnuts and the photos! OOooh! I definitely need a mini doughnut pan now! Just darling! Stumbled across your site...Absolutely beautiful! Love that little doughnut pan! Can't wait to make these for a baby shower this weekend!! The mom-to-be is having a girl so I will do a pink glaze...any tips on how to glaze them? 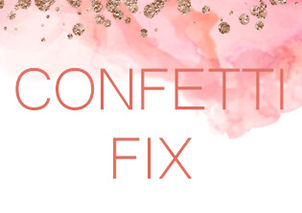 And do you have a good formula for getting the right pink color? Thanks! LOVE your blog! If you are using liquid red food coloring, only mix one drop at a time until you get the desired shade. Baby pink should only take one or two drops. The same applies to the gel colorant, mix in small amounts. Wilton has pink gels that are really pretty. I like "pink" and "rose petal pink" in their line. I'd also consider using a clear vanilla extract. 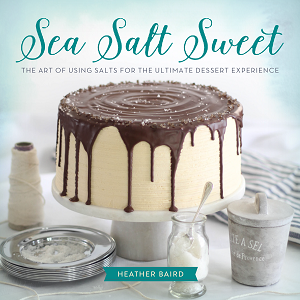 Brown extracts can sometimes muddle the icing color. When glazing, I dip the tops and let all the excess glaze fall back into the bowl before I flip the donut over. This keeps the glaze from running down the sides. If your glaze is too transparent (mine was at first) then mix in a little sifted powdered sugar to thicken it up. I added 1 extra teaspoon. It should not be so thick that it does not run back into the bowl when dipped. I found that if I sprinkled the nonpareils on right after dipping, they sometimes disappeared into the glaze. Let the donuts dry for about 30 seconds before you use the sprinkles. They will sit on top of the glaze and look perfect. These are ridiculously amazing.. can these be used as a wedding favor? They turned out extra beautiful and were a hit-I ended up making a strawberry glaze flecked with meyer lemon. They were the perfect shade of vintage pink :-) I still used the mini nonpareils like you advised. Thank you so much for your response! These are adorable! Can I have one?? I just got one of those donut pans. Going to try that recipe soon, oh and love the dish the newborns are in, a woman after my own heart. For me, this recipe only made 3 1/2 dozen. They are really tasty, though! Oh my goodness-- those are positively precious! The last thing I need is another specialty pan, but I'm feeling a strong urge to track one of those down nonetheless. I'm simply a sucker for doughnuts and adorable little mini things! I got the pan and made these last week, while they are definitely SUPER cute, they didn't taste very good, I thought they were very bland. So pretty I was inspired to go out and buy the pans. Love the little babies on the straw. Like Jackie says, SUPER cute! Oh, I am sure these little "rings of pleasure" are completely scrumptious...but REALLY, they are SO cute....what does it matter? I would enjoy their beauty for days, as they lounge on a their circular bed of porcelain...OK, we both know they would not last more than a few moments...Y U M ! Those are just the happiest little things, aren't they? I've printed the recipe and I hope to whip some up soon.... I'll have to go get that cute little pan first. YUMMY CAN'T WAIT TO TRY THEM !! THANKS FOR SHARING. I never thought about filling my donut pan with a tube. What a stellar idea! That's why I almost never use mine, because it's such a pain to fill them. Thank you so much! Yours are beautiful and it's better not to have them pink anyway since SB already does it. I succumbed- bought the pan, made the donuts and fell in love with the delicate vanilla flavor and the buttermilk definitely made the difference... tender crumb. Love the doughnuts, they look mouth watering yummy and simply perfect for a baby shower celebration. I think I will have to give them a go. I definitely want to experiment with different glazes- I love the suggestion above from MerBella to do a strawberry glaze with meyer lemon flecks!! These are the cutest donuts I've ever seen! I love your photos. Perfect springy looking treats. I made these and they turned out perfect what an easy and very nice looking treat for a shower or party. Thanks for the awesome recipe! Wow, I don't think doughnuts could get any cuter! I really like that you baked them instead. I'm afraid not. These are really best the same day you make them. They have an airy texture, but can become rubbery over time. 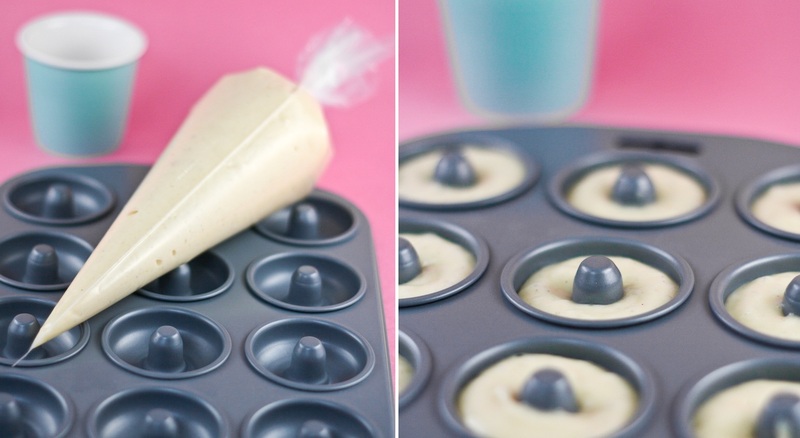 You may be able to make baked donuts out of a standard cake batter and freeze them. I've never tried it though, but I DO know that some cakes can be frozen and still retain a nice texture. These look incredible! I love your photography, your colour coordination, your origami... it's all perfect. I could spend the rest of my week just looking through all of your amazing posts! I LOVE the newborn baby doughnuts. Makes me want to snuggle them!! The doughnuts look like they taste pretty good! Hey! Love the donuts. I just made them. Super yummy and adorable! I just had a question. They were a tad dry for me and I'm wondering if you know of anything that would fix that. They weren't incredibly dry, but I think they would be perfect if they were a tad more moist. do you think a glaze would help? Or add a little more milk? thanks so much! never heard of a donut pan before! but the color of the frosting is fantabulous! just wondering-I'd like to use vanilla extract instead of the seeds from a vanilla bean. how much should I use!? I'd use 1 tsp vanilla extract in place of the vanilla bean. I've been browsing SprinkleBakes off and on for a while, but this is the first recipe I made, and I just made it for the first time tonight! Because I got a mini donut pan for Christmas. They are great! I even made them gluten-free and dairy-free because my mom is allergic, and they still turned out great. Thanks for the great recipe! Made these last night with what I THINK was a mini doughnut pan considering the batter only made 1 1/2 dozen... They came out delicious anyway! The taste is more like pancakes than a doughnut. I had 3 of them for breakfast, dunked in maple syrup. Hi! Do you know how to incorporate any other flavors into this recipe? I would LOVE this texture donut in vanilla bean, chocolate, lemon and strawberry for a party! Thanks! Would this recipe work with a regular sized donut pan? Looks delicious!! yes, could I use my 6 hole standard donut pan with this recipe?? I made these on Thanksgiving, and they were awesome! We had a few to take home, so I threw them into a ziplock bag. That was a BAD IDEA apparently because the nonpariels bleed all over the frosting (couldn't find white) and the icing sort of... Dissolved/absorbed into the donuts making them kinda awful. Do you have a recommended way to store and/or transport these so they don't get all gross? I was thinking about giving some away for Christmas, but I'm afraid I'll have a repeat of Thanksgiving. I've had the same problem with trying to transport these. They really get unattractive after a while under plastic wrap. The icing gets wrinkly and strange-looking. If I were gifting these, I'd skip the glaze. I'd probably butter them and coat them in cinnamon/sugar or powdered sugar instead of using the glaze. My mother had the same dish pictured in the third image :) These are quite adorbs and look amazingly delectable! My glaze was big solid blob. I couldn't get the food coloring to mix in until I added more milk. Then it was too transparent. They still okay, and I tasted one before glazing. Yum! Today I made these baby doughnuts and sprinkled them with a typical Dutch treat called "muisjes". This treat is normally sprinkled on a biscuit to celebrate the birth of a child, the colour is pink or blue according the gender of the baby. "Muisjes" are candy coated aniseed and I wanted to try it on the doughnuts as an alternative to the biscuit. They are delicious and so fluffy, we say it is a winner :-). I also added a little more milk for the glaze. Yummy. How can I make them less fluffy and more like the original Starbucks version? Hi Liz, I'm afraid you'll need a different recipe entirely. 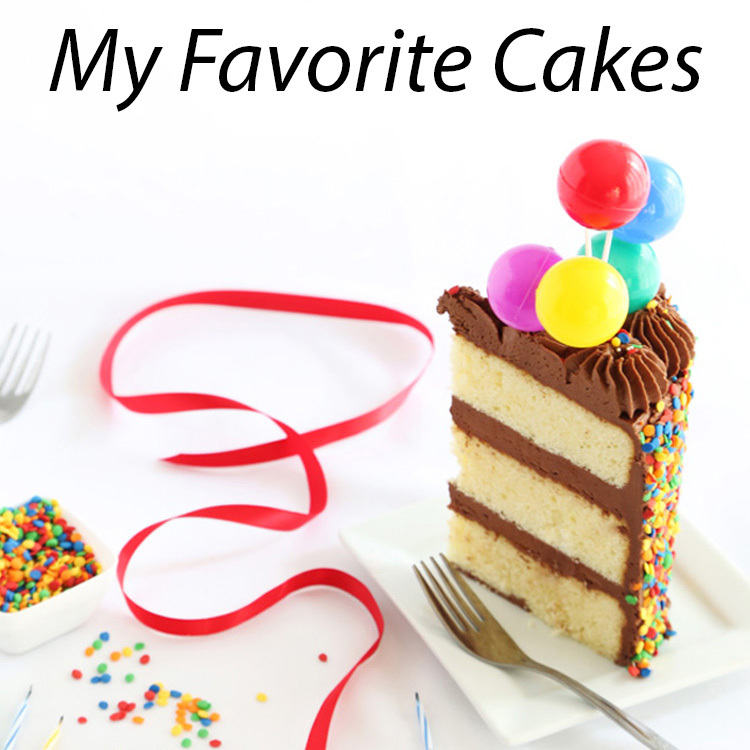 Try searching for 'old fashioned cake donut recipe' or 'sour cream cake donut recipe'. That will get you nearer to the Starbucks version.